Happy Thanksgiving and Black Friday! (Not sure if we should “celebrate” Black Friday judging by some of the stories in the news today, but still). 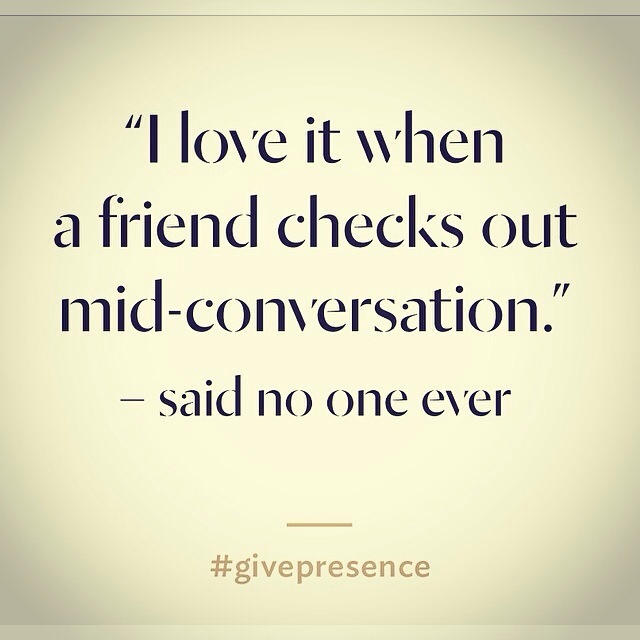 With all the festive spirit on social media my eye was caught by the lululemon campaign ‘Give Presence’. I watched the video and highly recommend you give it your attention for a few minutes. I’m so tired of the anthem of “I’m so busy”. Everything that is on your plate is there because you said yes to it. I have to hold my hands up here and admit that I am 100% guilty of this! Whenever I see friends and ask “How are you?” the refrain of everyone around the table is usually “Things are crazy right now! So manic! Can’t believe how busy I am! Woaahhhh hectic!” This has become the norm for us, and can often be as much about self-validation as anything else. It is also especially apt for people in their twenties who are often trying hard to over-achieve and prove that they’re successful. The culture of ‘busyness’ can create a paradox. We’re so busy telling our friends and family how busy we are, and admitting to our stress actually makes us feel more powerful than we would in the reverse situation. Oh yep, it’s that FOMO again. The fact is that as a nation we are working less hours than previous generations (about 36.3 on average), contrary to popular belief that our jobs are more demanding than ever. It’s probably fair to say too that a lot of our stress emanates from the need to fill our free time with meaningful activities and social commitments. Are we a culture that is too focused on being extraordinary and would rather burn out in flames than risk being perceived as boring? If you genuinely feel overwhelmed by life – whether it’s work or social pressures – we should have the courage to acknowledge it and try to give ourselves relief. Tell your boss that you’ve got too much on, clear some space in your calendar, but don’t moan about being totally slammed then spend hours checking Facebook, watching reality TV and scrolling through Instagram every night! It’s rare to have a job where you’re expected to answer emails at 10pm, and if your job really is that demanding then you should be loving it enough that you don’t mind, or getting the hell out. The truth is, of the most successful people I know none have ever said to me “I’m so busy”, let alone complain about it. That’s usually because they’re doing something that they’re passionate about and are able to make time for the important things when their attention needs it. In short, they know how to give presence. So the next time I feel myself on the brink of saying the “B” word, I’m going to try my best to hold my tongue, take a long, deep breath, and remember to be present, whilst silently giving thanks for everything that keeps my life full and active.